The microSampler has performance potential. PRESS RELEASE: The compact and powerful Korg "micro" series is now joined by an incredibly fun-to-use performance sampler. Announcing the Korg microSAMPLER, a keyboard sampler that lets you enjoy easy-to-use full-featured sampling, a loop sequencer, and internal effects - all with an intuitive interface that's designed for realtime performance. Our unique sampling method allows you to record, edit and map as you sample - directly from the keyboard. The microSAMPLER is designed for performance. In addition to triggering samples as on a conventional pad-type sampler, you can also play the samples at different pitches in a musical fashion, and even resample the result. The controllers you need for an exciting performance are laid out on the panel for intuitive operation. The status of the samples assigned to each key (and the item being edited) is indicated by the lit state of the LEDs running along the top of the keyboard, ensuring excellent visibility even on stage. 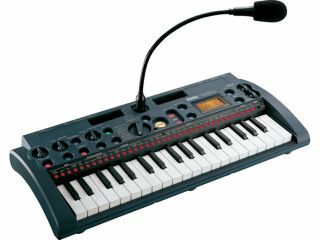 Both line input and mic input are provided to allow a broad range of input sources including electronic musical instruments, CD, and voice. A gooseneck microphone is included so you can sample on the go. To make it easy to sample from your portable audio player, a convenient caddy is located beside the mic jack. The microSAMPLER can run on batteries, so you can perform on the go - or capture samples anywhere. In addition, there's a resampling function that lets you play existing layered samples processed by an effect and played by the loop sequencer - and capture it all as a new sample. Since you can even sample while playing, the sampling process itself can become part of your expressive performance. This mode is for creating samples that do not require a note-off, such as drums and orchestra hits. This mode is best for creating instrument sounds that will be played back at different pitches on the keyboard. This mode is ideal for sampling looped phrases such as drums or vocals. With KEY GATE, you can take multiple samples from the same source or phrase and assign them to different keys as the source plays! The individual keys assign the sample and enable recording all at the same time. This intuitive method of sampling, editing and mapping in a single step is fun, intuitive and fast. For grabbing a groove as separate samples on individual keys, choose the AUTO NEXT mode and use Tap Tempo to match the BPM of the source material. The microSAMPLER will automatically divide the sample equally across multiple keys. Each key can be set to capture anything from a 64th note to a full two measures. This method lets you automatically perform the same type of sampling as KEY GATE. The microSAMPLER hosts a solid complement of top-end sampling features such as sixteen-voice polyphony, reverse playback, editing operations such as Normalize and Truncate, and a Time Stretch feature that lets you change the tempo without affecting the pitch. Selectable sample rates of 48 kHz, 24 kHz, 12 kHz down to 6 kHz let you sample at rates beyond CD clarity or add in that Lo-Fi vintage vibe. And yet the microSAMPLER is also designed to be easy to operate. Each bank contains 36 samples (a maximum of approximately 160 seconds of recording time for monaural samples at a 48 kHz sampling rate) and sixteen patterns of sequence data; the microSAMPLER lets you store eight such banks in internal memory. The pattern sequencer uses an overdub operating style that lets you continually layer your performances. You can switch between patterns during playback for seamless performances. Up to sixteen patterns (16,000 notes per pattern or a maximum 64,000) can be stored in each bank. Developed for Korg's KAOSS PAD series, the effect engine serves up a great selection of effects - so important when editing samples. The twenty-one effects include not only traditional delay and chorus, but also ring modulator and grain shifter, and even a Looper that's derived from the Loop Recording feature of the KAOSSILATOR Dynamic Phrase Synthesizer. The microSAMPLER features our new the natural touch mini keyboard, offering greatly enhanced playability and expressive power. By adjusting the proportion of the black keys and white keys, we've made chords easier to finger, and the touch has been improved so that rapid phrases can be played more easily. The box-shaped keys project a sense of quality, and also allow smoother glissandi.